If you have any questions or suggestions you are welcome to join our forum discussion about Positioning at Breakouts from Inside Days. In the current article we will talk about one of the most popular trading strategies based on volatility changes – the inside day breakout strategy. It is commonly used due to its high reliability, relative accuracy and simplicity as it requires no help from indicators – just market observation. It is based on the assumption that the longer the market remains in a trading range, and especially if it is narrowing, the closer to a breakout it comes. In the article “Other Types of Signal Bars and Patterns” of our Price Action Trading guide we discussed the so-called inside-inside pattern. It is a breakout setup, which can become a flag, thus a continuation setup, or a reversal formation. Basically, the strategy we are about to discuss responds exactly to the inside-inside pattern, but looked upon on a daily time frame. A variety of the inside-inside pattern, the inside-inside-inside pattern is an even more reliable breakout setup. An inside day is a day whose trading range is completely encompassed by the previous one, i.e. it has a lower high and a higher low compared to the previous day. For our trading strategy to work, we will need to have at least two consecutive inside days, thus this is exactly an inside-inside pattern. From here on, the larger the number of the inside days, the more reliable the breakout pattern becomes. The goal is to successfully predict the upcoming move, without getting trapped by a false breakout (fakeouts). This strategy is best used on daily charts, although some traders prefer hourly time frames, and especially before the open of the London and the US markets when volatility spikes. It can be used in conjunction with each currency pair, but fakeouts are less frequently observed at tighter range crosses, such as USD/CAD, EUR/GBP, EUR/CAD etc. To increase the chance of successfully predicting the direction of the breakout, a trader can use this strategy with the help of technical analysis patterns or indicators. First of all, because inside-inside patterns’ extremes are forming in such a way that they are basically a triangle or a wedge, the inter-pattern movement will be of similar behavior and most likely with the same outcome. Take a look at the following screenshot. As you can see on the example above, the marked inside-inside-inside pattern took the form of a symmetrical triangle. Although the last candle’s high slightly extends beyond the previous one’s, it is negligible (as we have said before – what seems like an almost perfect pattern will trade like a perfect pattern). Moreover, the three inside bars were large doji bars, evident for the bulls’ attempt to reverse the first big bear trend bar. As they failed to do so in three attempts and the price dropped below the first doji’s low, bulls closed positions and bears pushed the market further down. So there are three factors which have suggested the upcoming breakout – inside-inside-inside pattern (more definitive than the inside-inside pattern), its form of a symmetrical triangle and its structure of doji bars. In general, if the market is forming inside days near the top of a trading range with the form of an ascending triangle, it is more likely for the breakout to be in the upward direction, and vice versa. Also, if the price movement holds in a trading range right above a significant support level, such as a moving average, round numbers or Fibonacci levels, a downward breakout is less likely and even if it occurs, it stands a bigger chance of failing. The strategy itself consists of several steps. Let us assume we will be entering a long position. Logically, the first step would be to look for a currency whose average daily range is contained within the previous day’s trading range and it itself is an inside day. 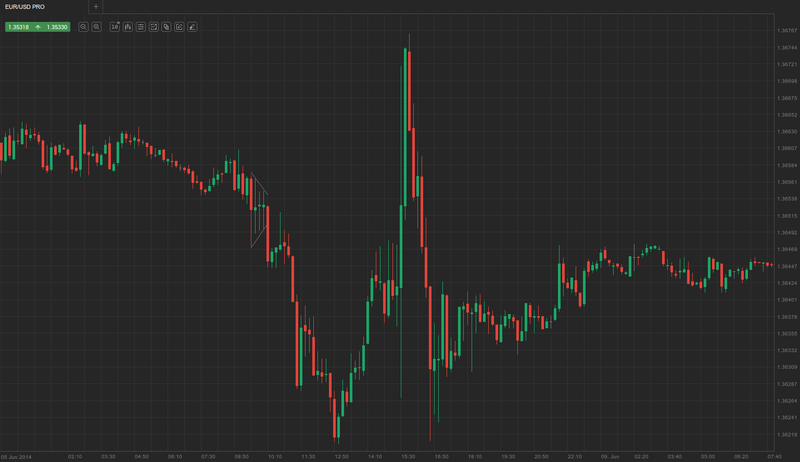 As such a scenario unfolds, you would want to buy above the previous inside day’s high, say 10 pips above it. We said in the article “Other Types of Signal Bars and Patterns” that inside-inside patterns are traded by entering on the breakout, while protective stops are placed beyond the opposite side of the pattern. Particularly in our case, we can protect our position from a failed breakout by placing a stop and reverse order 10 pips below the low of the previous inside day. If the position turns around and your stop and reverse order is executed, you need to place a protective stop at 10 pips above the high of the previous inside day. In both cases you must aim for a profit of double the amount risked. Upon reaching it, you can either exit the market or scale out and leave part of your position in the market. If you choose the latter, you must trail your stop to protect yourself from an unexpected reversal. Let’s check out the following example. 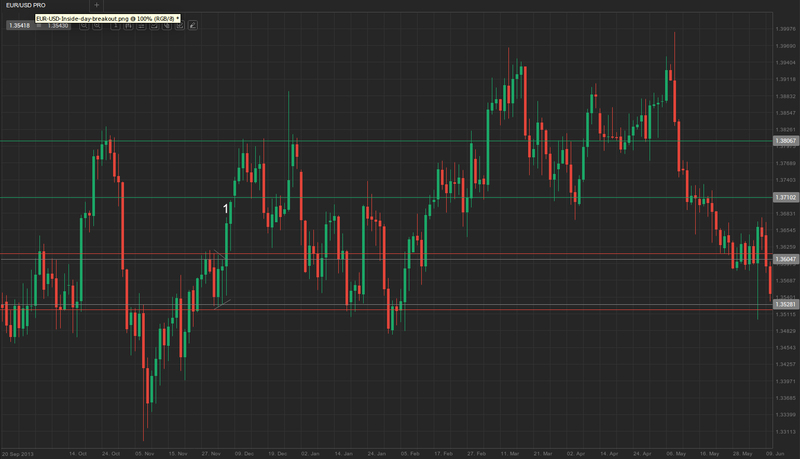 You have in front of you a daily EUR/USD chart. Let’s assume that you are in the beginning of December 5th, represented by bar 1. As you see the inside-inside pattern, which the previous three bars had formed, you expect that a breakout might occur. According to our inside day breakout strategy, you should place a long entry order 10 pips above the high of the previous inside day or a short entry order 10 pips below the low of the previous inside day. The high and low are marked by the horizontal grey lines, respectively at EUR/USD 1.3604 and 1.3528, while the 10-pip distance is illustrated by the two red lines, respectively at 1.3614 and 1.3518. In our case, the market accelerated up and broke out of the trading range at bar 1, which triggered your long-entry order at EUR/USD 1.3614. As the order is executed, you must place a stop and reverse order 10 pips below the low of the previous inside day (in our case the lower red line at EUR/USD 1.3518). Having estimated your entry point and stop-loss levels, you now need to estimate your profit target. According to our strategy, your profit target should be double the amount risked. The amount risked equals the entry point minus the stop-loss level, which in our example is: 1.3614 – 1.3518, or 96 pips. We entered at 1.3614, which means that double the amount risked will be at 1.3614 + 2 x 0.0096 = 1.3806, as visualized by the upper green line. However, more conservative traders would have preferred to scale out and take partial profits at 100% the amount risked (at 1.3614 + 0.0096 = 1.3710, as visualized by the lower green line), and then swing the remaining portion of their position up, while protecting it with a trailing stop. As you can see, in our case the market performed the whole measured move up, but reversed only several pips after.